Chronic traumatic encephalopathy, or CTE, is a diagnosis for dead people. Last month, Junior Seau was found in his home in Oceanside, Calif., with a fatal self-inflicted gunshot wound to the chest. A familiar sequence unfolded: His brain was requested by both the Brain Injury Research Institute and Boston University's Center for the Study of Traumatic Encephalopathy—the two main brain banks chasing damage in former football players. If the family consents, the brain will be sliced open and put under a microscope. Given Seau's profession and the nature of his demise, the expectation is that the tissues will show a buildup of a protein called tau, creating tangles like the ones found in victims of Alzheimer's disease. But so what? It's one more brain, to go with the 60-plus brains of former players who have already demonstrated postmortem signs of CTE. The question, after a decade of brain-slicing autopsies, is when any of this will help players before they're dead. Doctors can't just crack open living patients' skulls and lop off slices of their brains to stick under a microscope. "I've always sort of thought of tau imaging as the holy grail on the issue of chronic brain damage, especially CTE," said Dr. Julian Bailes, one of the founders of the Brain Injury Research Institute (BIRI). The grail isn't in hand yet. But the marker that attaches to tau is among the most promising of an assortment of research projects seeking to make CTE something other than an after-the-fact conclusion. Tools to see CTE in living players, tests and techniques honed on other forms of brain damage that may be able to track the disease's progress—science is trying to get inside the skull, before it's too late. In 2009, the NFL, under heavy fire from the House Judiciary Committee, acknowledged for the first time the long-term consequences of concussions. Since then, the league's ideas about how to protect the living have focused on improving the equipment (better helmets and thighpads) and conspicuously fining defensive players for especially gruesome-looking hits. Non-NFL-affiliated studies have tended to coalesce around those issues. We've measured the force of collisions in mouthguards and pads, and we know the effect of those anti-concussion helmets, too. But taken as a whole, the efforts to quell or at least understand CTE have been, to this point, a mix of the cynical, the haphazard, and the fatalistic. There is real value in gathering data about the force of impacts, but the context has often been backward-looking, substantiating science that's no longer really in question. The brain donation and autopsy, for instance, is now more of a mourning rite than a marshalling of fresh evidence. The NFL has been too busy cosseting itself against any potential legal liability and seeking out second opinions to ask the only question left: What now? The frontiers of CTE research—living patient diagnosis, prevention, risk assessment, cures—have been largely left unexplored. It's not as if the league hasn't had time to do real homework. It's been 10 years since Dr. Bennet Omalu first cut into Mike Webster's brain and discovered CTE, and seven years since Omalu's work appeared in the July 2005 issue of Neuroscience, where it was shouted down by the NFL. Dozens of dead men's brains later, the disbelievers have mostly come around. At its core, CTE is a neurodegenerative brain disease, not much different from Alzheimer's, Parkinson's, or early-onset dementia. It breaks part of your brain, and that affects how you behave and function. But unlike other cases of cognitive decline, we believe we know the root cause: repeated blunt head trauma. The research could have a profound effect on the NFL and possibly the NCAA. Being able to track the buildup of tau (pictured) is the key to any future serious player safety regime. While we don't have a cure for CTE's closest analogs, having that starting point makes a big difference. If we can see how the disease unfolds, we have a chance of stopping it. Thus: Gary Small's UCLA research into scanning living subjects. It's funded by BIRI, which was founded by Omalu, Bailes, and Robert Fitzsimmons. At the center of the study is a patented radioactive biomarker that Small co-invented for diagnosing Alzheimer's disease. The marker attaches itself to both tau protein tangles and amyloid plaques, the two elements necessary to diagnose Alzheimer's. There are other markers that attach to plaques, but this specific marker, [18F]FDDNP, is the only one known to lock onto tau. In the absolute simplest terms, this is the only known substance in the world that can make CTE show up on a scan in living patients. PET imaging tech is half a century old, and though FDDNP is relatively new, it's still been around for years. So it's strange to think about the marker being on the cutting edge of a fairly recently discovered brain disease. If the marker can find and pinpoint CTE, why hadn't anyone tried it before now? And for that matter, why isn't it already in use? More than finding answers, science is about asking the right questions. For something like FDDNP to be tested on NFL players, the thought not only has to occur to someone, but that someone then has to get together some grants or other funding, and some applicable test subjects. The case of something like PET imaging is doubly difficult, because a PET scan is literally a matter of injecting a radioactive material into your patients and using a giant Geiger counter to see where it lands. Radiation exposure is tracked closely, and a person can receive only a limited number of scans per year, Small said, though he adds that "the only potential side effects people get from scans is a bruise where the IV goes in, or a backache from lying in the scanner." Small, whose background is in geriatric psychology and Alzheimer's disease, came to CTE research when the chancellor of West Virginia University introduced him to Bailes, who was at WVU at the time. Small's initial study has been funded by BIRI, and Bailes helped refer retired players to Small to try out the scan. The study is still a pilot program, and there's work to be done before it can be translated into something we can use to diagnose developing cases of CTE—mainly stemming from the fact that FDDNP locks onto not just tau, but the amyloid plaques as well. Still, a biomarker would be perhaps the most important development in the field since Omalu looked at a slide of Webster's brain and saw tau's telltale brown and red splotches. Small couldn't share the specific results of his studies because they haven't been published yet, but he was confident. "We think this is going to be a very helpful way to better understand and identify people who are at risk," he said. "We've autopsied more players than anyone—more than 30 now—and while the science is intriguing, we can only make the diagnosis after death," Bailes said. Small's work, he added, "gives us hope we'll be able to diagnose and identify risk in living patients." If the scans are effective, they could have a profound effect on the NFL and possibly the NCAA. Being able to track the buildup of tau is the key to any future serious player safety regime. This would likely require regular PET scans—yearly, maybe, or twice a season. An extreme case of CTE—like Webster's—would have a better chance of being caught, especially in the latter stages of a player's career, when his protein levels would be higher. PET scan, similar to Small's work with CTE, of brain amyloid and tau in adults with Down syndrome. But even with reliable scans, the risk factors and the rate of tau accumulation would differ from player to player. So Small's group has been looking at ways to refine the risk assessment available to players. "We're looking at genetic factors, a player's position, other behaviors that worsen brain health like smoking or drinking," he said. He's also keeping an eye out for other signs or markers that could be used to identify tau. If, for example, a specific change in a patient's blood were to occur when there's a buildup of tau, maybe a blood test could offer an affordable and less-invasive alternative to the PET scan. Cheaper alternatives are a crucial point, too. Right now, each scan costs about $5,000. The price could drop as more companies and groups license FDDNP from UCLA for research. But the scans still probably won't get into the range where the average high school or Division III college could afford to have their players tested multiple times a year. In Las Vegas, Dr. Charles Bernick is attacking the same problem from a different angle. Instead of looking for CTE itself, Bernick wants to know how the disease spreads and changes its victim over time. He's wrapping up the first year of an ongoing study tracking the cognitive health of over 100 boxers and MMA fighters, some of whom enlisted at the urging of a family member or spouse who'd started to notice changes in behavior. The goal of the study is to pinpoint when, exactly, a fighter should hang up the gloves. The Professional Fighters Brain Health Study at the Cleveland Clinic's Lou Ruvo Center for Brain Health pulls from the center's experience with similar diseases, like Parkinson's, to develop a working modus operandi for attacking CTE as a traditional brain disease. (The difference, of course, is that those other diseases are a constant deterioration of brain function, while CTE is caused by intermittent brain trauma.) The study uses a combination of MRI scans and computerized cognitive tests—exercises ranging from simple memory tests to questions about what the fighters did or felt on certain occasions—to track how the subjects' brains and cognitive abilities change or degrade as their careers advance. If it can map the trajectory of CTE, we can not only extrapolate how much is too much, but use that information to begin working on cures or preventative measures—not just for boxing and MMA, but for all sports and occupations that pose a risk of CTE. Bernick hasn't been in contact with the NFL. "It wouldn't be a bad idea in the field for all the oars to be rowing in the same direction," he said. "So if the NFL and hockey and the military were collecting core information, we'd learn a lot faster." So far, Bernick's team has mapped out a regimen to test fighters at regular intervals for any signs of cognitive decline. The process, which involves computer-based cognitive tests, speech analysis, and thorough MRI scans, closely resembles the tests administered to Alzheimer's and EOD patients. The MRI in particular is noteworthy. Like PET scans, it's an old technology that can be augmented by asking new and better questions. Specifically, Bernick is trying to hunt down CTE by measuring, comparatively, the size of certain parts of the brain over time, looking for swelling or scar tissue; comparing the brain's conductivity in a resting state to when it's active; and examining blood-vessel buildup, which happens around tau protein. It's not as easy as just tossing a marker into the brain and firing up a PET scan, but it could be far more scalable outside of the lab. There are some compromises, though, in the interest of making the test less time-consuming for fighters and other athletes. Unlike Alzheimer's diagnostics, for example, family and friends aren't brought in for cross-referencing on the cognitive tests, and there isn't a genetic analysis of close and distant relatives. "There's way more that we need to do," Bernick said, "But we had to make it practical. The whole testing takes about two hours to do. It has to be tools you can use anywhere, and it's probably not realistic to expect everyone to go in for a two-hour neuropsych test, but maybe a 20-minute computerized test will do." The preliminary findings have been suggestive. The fighters were split into three groups: those who had fought for fewer than six years, those who had fought for between six and 12 years, and those who had fought for more than 12 years. They showed a marked decline in cognitive ability from group to group. At six years, there was some drop-off; at 12 years, there was a much larger drop-off. The six-year groupings were arbitrary, and the data will be shuffled some to try and get a more accurate line of demarcation. Year 2 also introduces retired fighters to the study, so new controls for age will have to be enacted, and more frequent check-ins would obviously be ideal. But for now, it's a starting point. Year over year, the data could be used to pick out different influences: genetic traits that might make humans resistant to CTE, various fighting styles, safe and dangerous layoff periods between fights. And, of course, there will be post-mortem data. The clinic has made arrangements to supply many of the fighters' brains to one of the large brain banks involved in CTE research. The important thing to remember about this research—all medical research, really—is that it's not looking to nail down a universal imperative. The surgeon general doesn't tell you the maximum number of cigarettes you're allowed to smoke, or the maximum poundage of cheeseburgers you should eat. So there will not be, say, a scientifically validated eight-year limit on fighting or contact sports. Instead, Bernick is hoping to build a tool for evaluating whether individual fighters should be allowed to continue fighting. "If you're 38 years old and go to the [Nevada Athletic Commission] to be relicensed, what do they have to go on?" he said. "Maybe the last few fights' performance. But if there was information available to them, they would use it." Bernick said his group has considered using information from the UCLA PET scans but is holding off because the marker isn't specific to tau itself, and there's still a chance that a tau-only agent will be found. For their part, the fighters say that they're going to take the results seriously. "If they know that they're sustaining damage to their brain, they would stop," Bernick said. "Maybe a 22-year-old wouldn't say that, but it kind of evolves as you mature. I'm not sure totally people would ignore it. There are regulatory agencies who should be looking at this too. Hypothetically, if you fought eight years, you're required now to get an MRI scan once a year, or a computerized cognitive scan twice a year. If it's more severe, maybe you'd have to stop." Brain injuries in football happen because of a phenomenon that Bailes, now co-director of NorthShore Neurological Institute, calls "brain slosh." "That's where the brain is free to move around inside the skull, regardless of helmets or external protection, because it floats inside a bath of fluid called Cerebral Spinal Fluid (CSF)," he explained. "Despite the fact that sports and the military looks at brain protection from the outside, we think you have to look at it from the inside." In fact, Bailes is working on an absurdly simple accessory that could protect brains from being injured in the first place. A rendering of the "internal jugular vein compression device." Courtesy Neurosurgery. Think of it this way: In a collision, the brain is basically driving without a seatbelt or an airbag. While better helmets and the banning of helmet-to-helmet detonations might help keep your skull intact, they would do nothing to stop the brain from smashing into the windshield in even minor collisions. 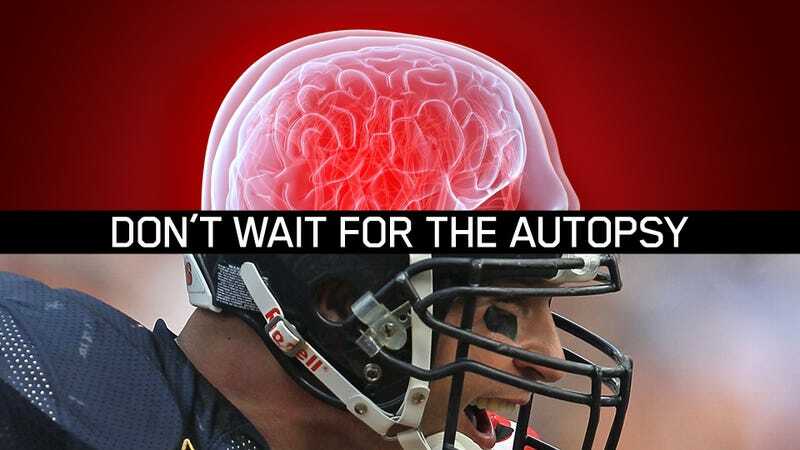 So how do you stop the brain from taking a beating on every routine block, tackle, and other impact—the real killers? Bailes's answer to this brain slosh amounts to stuffing the whole car full of packing peanuts. His newest research takes groups of rats and puts a small, circular device around their necks, compressing their internal jugular veins. That increases the volume of blood in the skull, which creates added pressure on the brain, locking it in place. In theory, that should keep the brain's movement inside the skull more in line with the skull's own movement, allowing all the new space-age helmets to do their jobs. So far, Bailes's team has seen a 30 percent increase in cranial pressure, and, after concussing the rats and examining the resulting computer models, an 80 percent drop in the precursors to amyloid protein. "This was only a proof-of-concept pilot study, and it hasn't been proven in humans, but we think the theory is sound," he said. "If it moves forward, we're going to expand to a broader group of patients, and we hope to do that sooner rather than later." If the research can be replicated and no unforeseen safety concerns pop up—neither of which is guaranteed in research like this—there are already people and players volunteering as test subjects. Why wouldn't there be? If a simple necklace could reduce the accumulation of brain injury, and there is virtually no downside to wearing it, isn't that worth whatever minor discomfort it causes and a few hours a year of testing? But for all the practical upside of these projects, it's hard to make ends meet. I asked Bernick where he hopes his project tracking fighters' brains will be in five or 10 years. He replied: "I mean, before anything else, we hope to still be here in five or 10 years. The major goal is to keep the thing going." The fighter brain-health study costs about $250,000 a year, but that number's misleading, because so much of what goes into the study—tests, scans, and most crucially, man-hours—is donated by the Cleveland Clinic and its staff. "Without that much help, it would probably cost twice as much," Bernick said. The NFL's latest collective bargaining agreement sets aside $100 million to put toward research, much of which is expected to go to brain injury. But so far, only $1 million has been distributed—to Boston University's CSTE. This issue of funding—in Las Vegas, in tau protein imaging, in all of the studies that haven't or won't get off the ground—is more difficult than it seems. The Nevada Athletic Commission is deeply interested, and supportive, of the Cleveland study, as are big time fight promoters like Bob Arum's Top Rank and Oscar De La Hoya's Golden Boy. "Everybody at the gyms around here have been very great about this," Bernick said. But despite financial uncertainty, the study hasn't taken money from any of them. "An interesting dilemma is where you get your funding, and conflicts of interest," he explained. "Doing studies like this requires funding, but if you're heavily indebted in an agency that has a vested interest, there can be a view of a conflict of interest." That's also why he hasn't reached into the NFL's $100 million pockets yet either, though he absolutely would if it came down to a decision to accept funding or discontinue the study. For Small's research into the tau protein biomarker, it's partially a matter of getting the word out. Because FDDNP is owned by UCLA, it can be licensed to any pharmaceutical company that wants to use it for studies. (Siemens licensed the marker for non-CTE research for a few years, but ultimately abandoned it.) "That would help drive the cost down, especially for the scans, but we'd still need further grants," Small said. The group has applied for an NIH grant, and submitted several studies and ideas, but it hasn't found any additional funding. Would he consider turning to the NFL and its $100 million slush fund? "Absolutely," he said, "if there are no strings attached. I understand the financial pressure the NFL is facing, but I'd hope that they want what's best for the players." What does it mean for the viability of brain-injury research if even tau biomarking—the holy grail—has trouble finding backers? The logical place to stage a project like that would be one of those huge, überprofitable biomedical conglomerates. That's not happening. For competitive reasons, the companies won't talk about business strategies and future plans on the record, but the implication is unmistakable: There is no money in it. Not yet, anyway. As with the search for a tau protein biomarker, there just isn't the widespread need for continued research in CTE the way there is for other forms of brain deterioration. A representative at one company who asked to not be named explained that, while recent talk about pulling the military into the ongoing brain-injury discussion could go a long way toward making the financials work, it still wouldn't be enough. Despite all the attention it's gotten, a health crisis affecting wealthy young celebrities in America's most popular sport is still only a niche concern. "It's not like cancer, where your constituency is everyone, or even Alzheimer's, where there are millions," he said. "We just don't get hit in the head very often." Kyle Wagner is a writer for Gizmodo. Top image by Jim Cooke.